Meet Tino and his SFL. Tino (Valentino) is Bruce’s brother. When he was 8 he developed a hunched back with prominent spine in the mid spine area. At the time his vets suggested an MRI with a possible operation which they said might extend his life by 2 years. That was 6 years ago! He has no obvious mobility issues now and, at the time, he was treated with massage and physiotherapy. He hasn’t had any physical therapy recently, so we were asked to work with him at the same as Bruce as they are now 12. Luckily, we now have two members in the AchyPaw team. Bruce decided that Chris was his and I worked with Tino at the same time. Tino wants everyone to be happy and gets worried if they are not, or if he thinks they are not. He has his security blanket which he brings to anyone who comes to the door and then lies sucking and chewing it until he realises you are a good person. Although Tino does not really lie – he squats like a greyhound. He has very long legs and neck. His Mum describes him as Giraffe neck. 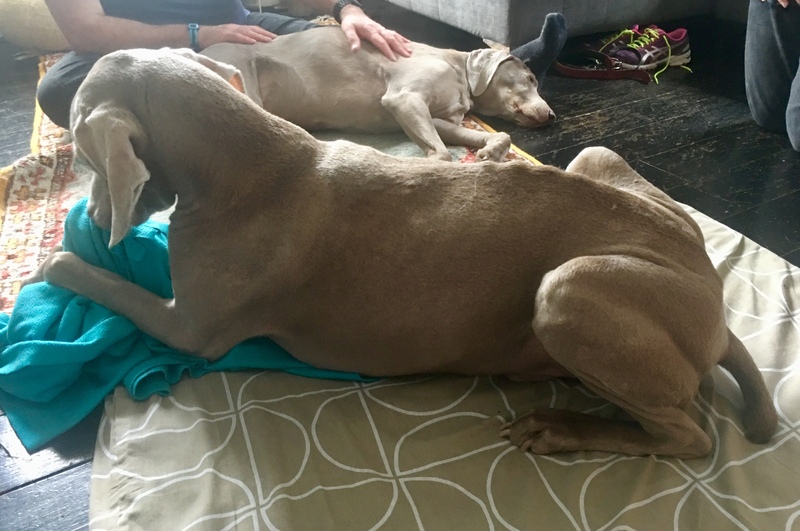 As well as his stiff back, the way he sits means that his thighs and adductors are also a lot tighter than his brother – who lies quite happily thank you, farting away during the massage session. One of the things we bring with us in our canine physical therapy is skill and expertise from human massage. That morning, Chris had read a paper from the JING website entitled “Tight Jaw? Tight Hips!” which stated that many patients experience jaw pain or teeth grinding related to muscle tension in the jaw. The article suggested that just working in that area might be looking in the wrong place. The author said look at the whole body, the gait, and their hip alignment. They referred to work by Tom Myers, the structural integration expert (read his books if you’re interested by fascia – I love his work). He describes the Superficial Front Line in his book Anatomy Train which is one of 12 myofascial chains. The SFL starts at the top of the feet and travels up to behind the ear and jaw. Hmmm…..let’s try massaging Tino’s jaw and see if his tight hips relax. Oh. My. Gosh. Within minutes his whole body relaxed and his previously reactive hip and thigh muscles loosened allowing me to start working with them. He ended the session completely soft and pliable. And happy. And he had stopped using his security blanket. A big success. 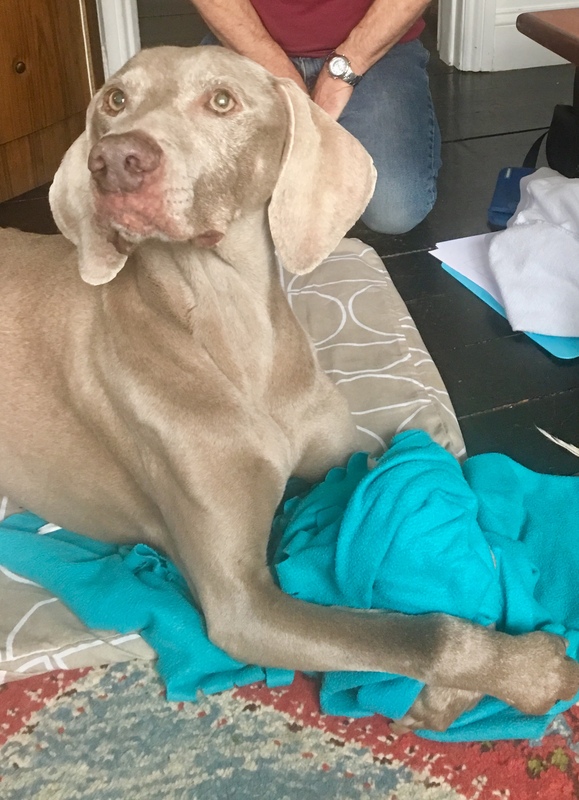 The JING article concludes with “…all these pieces of information can be used to…..design a better treatment plan” We’d add….don’t just stop with canine massage techniques and treatment plans but look at combining them with research and methods used in human massage. We’ve had so much fusion and cross-overs in the past 6 years between human and canine massage. But Tino doesn’t care – he’s just happy we’ve found, and helped, the problem. And that is #RESULT. This entry was posted in acheypaw, achy paws, AchyPaw, achypaw myotherapy, Brighton Dog Massage, canine arthritis management, canine myotherapy, canine myotherapy, dog myotherapy, achypaw myotherapy, myotherapy, achy paws, Dog, Dog massage, dog myotherapy, massage benefits, multimodal, multimodal therapy for dogs, myofascial release, myotherapy, not just arthritis, south coast dog massage, south coast myotherapy, therapeutic massage and tagged acheypaw, achy paws, achypaw, achypaw myotherapy, achypaws, canine arthritis management, Canine massage, canine myotherapy, Dog massage, dog muscle therapy, east sussex, myofascial release, south coast dog massage. Bookmark the permalink.